HSBC Bank Malaysia Berhad is a wholly-owned subsidiary of the HSBC Group. HSBC Holdings plc, the parent company of the HSBC Group, is headquartered in London. The Group serves customers worldwide from around 8,000 offices in 87 countries and territories in Europe, the Asia-Pacific region, the Americas, the Middle East and Africa. HSBC Bank Malaysia Berhad was locally incorporated in 1984 and is a wholly-owned subsidiary of The Hongkong and Shanghai Banking Corporation Limited (a company under the HSBC Group). In 2006, HSBC was the first foreign bank to be awarded a Takaful (Islamic insurance) license in Malaysia. HSBC Amanah Takaful (Malaysia) Sdn Bhd, a joint venture between HSBC Insurance (Asia Pacific) Holdings Limited (49% shareholding), Jerneh Asia Berhad (31% shareholding) and Employees Provident Fund Board of Malaysia (20% shareholding), commenced operations in August 2006. 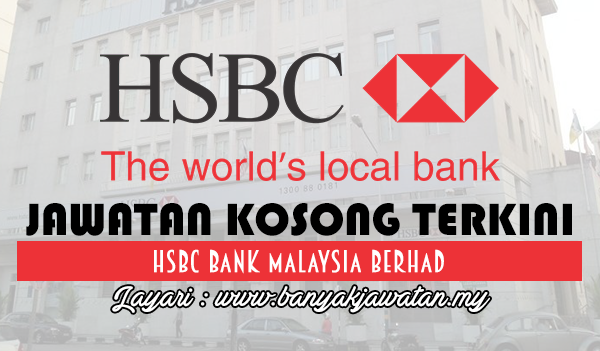 In 2007, HSBC Bank Malaysia Berhad was the first locally incorporated foreign bank to be awarded an Islamic banking subsidiary licence in Malaysia, and HSBC Amanah Malaysia, a full fledged Islamic bank wholly owned by HSBC Bank Malaysia, commenced operations in August 2008. HSBC in Malaysia has a network of 52 branches nationwide, of which 10 are Islamic finance branches. 0 Response to "Jawatan Kosong di HSBC Bank Malaysia Berhad - 1 March 2018"